The public is invited to learn more about an N.C. Department of Transportation project to replace the U.S. 701 bridge over I-95 at Exit 90 and reconstruct the interchange’s ramps and adjoining intersection with N.C. 96/Devils Racetrack Road in Four Oaks. People can see the preliminary design, ask questions and submit comments about the proposal during a meeting from 4 to 7 p.m. on Thursday, Feb. 28, at Four Oaks Middle School’s cafeteria at 1475 Boyette Road. No formal presentations will be given, so people can attend the open house at any time. The department proposes replacing the bridge over I-95 – an interchange built in 1957. The outdated bridge needs to be raised and widened, and the interstate ramps would be modified to improve safety and traffic flow. As part of the proposal, roundabouts would be built at two off-ramps and at the intersection of U.S. 701 and N.C. 96. The intersection is adjacent to the interstate. 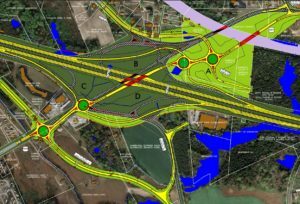 The engineers and consultants have evaluated different designs to recommend one that would minimize impacts to existing businesses and wetlands that exist around the interchange. Those who can’t attend the meeting may submit questions or comments to an NCDOT project consultant, James Byrd, at 919-424-0437 or jabyrd@hntb.com. NCDOT will consider comments submitted by March 15.